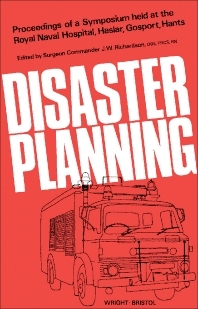 Disaster Planning covers the proceedings of a symposium held at the Royal Naval Hospital Haslar, Gosport, Hants in October 10 and 11, 1974. The book focuses on deliberate actions to be carried out in the occurrence of a disaster. The selection first underscores planning on maritime, railway, and road traffic accidents. Discussions focus on control of an incident, multiple accident procedures, medical aspects of road traffic accidents, role of railway medical officers, railway staff action at an accident, local major disaster plans, and survivors and rescue. The manuscript then takes a look at nuclear accidents, civil disturbances, and major fires. Topics include types of major fires, management of casualties, public relations, decontamination, casualty handling, and public health aspects. The publication ponders on control at a scene of disaster, categorization of casualties, road transport and communications, reception and triage of casualties, and supplies. Concerns include drugs, blood, stretchers and blankets, action by officer in charge of division, and recovery stage of incident. The selection is a dependable source material for researchers interested in disaster preparedness.